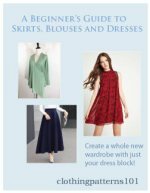 While there are many, many pattern drafting techniques you can use in turning your basic block into a stunning fashion, there are a few basics that you'll use again and again. Manipulating darts - to move them where ever you want them, or change them into attractive shaping seams - and "slashing and spreading" your pattern to add fullness are two of the most commonly used methods of drafting a pattern. 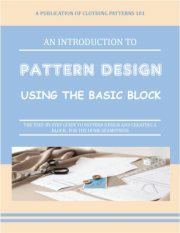 With these 2 basic pattern drafting techniques, you can achieve ANY shape you desire! Want a full sleeve? Slash and spread! If you want a pleated skirt with a yoke at the waist, you'd use both techniques - and this is very common. In fact, once you learn what you can do by manipulating darts and slashing your patterns, you'll come up with design ideas you'd never thought of! The easiest way to learn these techniques is to practice using quarter scales. These tiny patterns are simple tools you'll use to trace and manipulate the pattern, without wasting a lot of paper or using cumbersome full-scale patterns. 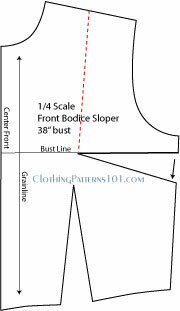 Print out a quarter-scale pattern (basic dress and basic pant) and start practicing! Darts are used to control fullness and shape the fabric to your body. 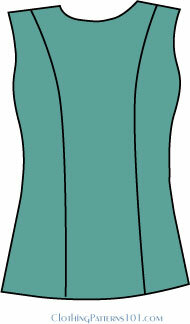 On a bodice, for example, darts serve to shape the fabric around the curves of the bust. Bust darts are usually placed at the side of the bodice, and at the waist if the bodice needs to be close-fitting through the torso. This traditional placement of the darts may look "clunky" and old-fashioned in many styles. The solution isn't to eliminate the darts - that would ruin the fit of the bodice - but rather to manipulate them so they become a part of the style of the bodice. You can get the same fit as a traditional 2-dart bodice with a princess seam. The princess seam is a sleeker version of a fitted bodice, with the 2 parallel lines offering both fit and styling variations. It is achieved by simply moving one of the darts to the shoulder, and then joining it with the waist dart. Easy! You can create variations on this seam, too, shaping from the armhole instead of the shoulder. And you can use these seams for colorblocking your top or bodice, too! Slashing and spreading the pattern ADDS fullness. Your basic block is close fitting and, of course, you want a variety of shapes in your closet. For a full skirt, for example, you'd draw lines along the length of your skirt, cut along the lines, then spread the resulting pieces to achieve a full hem. You'd also use this technique for a pleated skirt, but you spread the pieces differently. 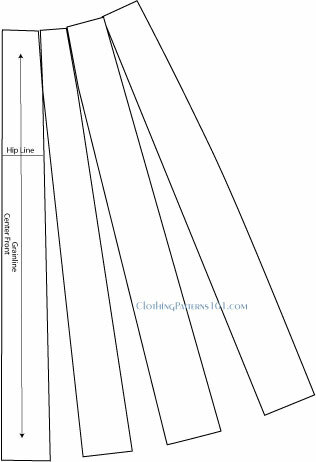 Go through the examples on the pages below to learn the basics of the pattern drafting skills. Then think about how you can use them to achieve the styles you like. You'd be amazed at the ideas you'll come up with! Practicing with full-scale patterns is cumbersome, so we have provided a printable quarter scale pattern for your use. Just print the 2 pages, cut them out, and use them to trace and manipulate your darts, or to slash and spread copies of your pattern. (Learn more about that here).